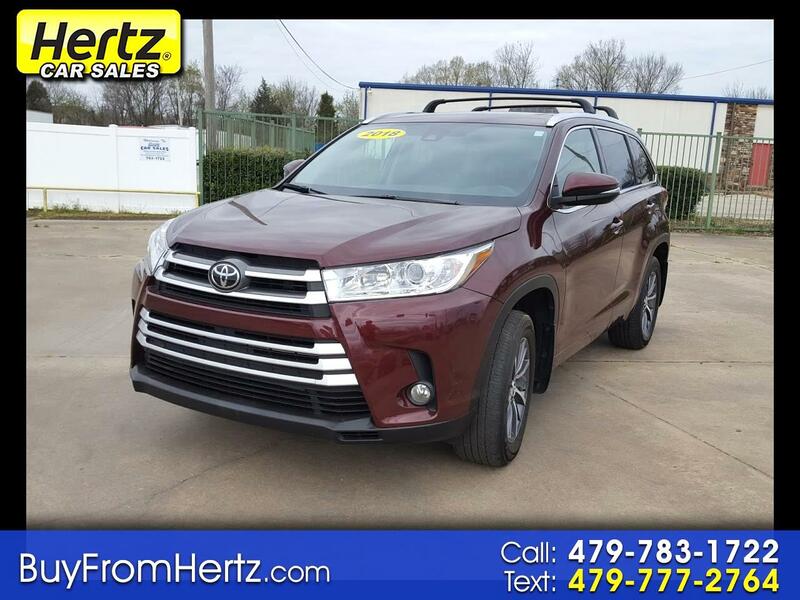 Ooh La La Rouge Mica 2018 Toyota Highlander XLE AWD 8-Speed Automatic Electronic with ECT-i 3.5L V6 AWD, ABS brakes, Active Cruise Control, Alloy wheels, Electronic Stability Control, Front dual zone A/C, Heated door mirrors, Heated Front Bucket Seats, Heated front seats, Illuminated entry, Leather Seat Trim, Low tire pressure warning, Navigation System, Power Liftgate, Power moonroof, Remote keyless entry, Steering wheel mounted audio controls, Traction control. Hertz Car Sales is an used car dealer serving Fort Smith and the River Valley for over 40 years. We pride ourselves on serving our customers by offering a variety of quality, late-model, low mileage vehicles at unbeatable prices, and friendly service from our no-pressure, no-hassle sales staff. We offer the best cars from Hertz rental fleets all over Arkansas, so you know you are getting the highest quality, well-maintained vehicles when you buy from us. Come see us for a test drive at 2810 Midland Blvd. Or call us at 479-783-1722. Call (479) 783-1722 today to schedule your test drive!